Cr-Mo powder-metal steels can be a cost-effective replacement for traditional Ni-Mo P/M steels. Here’s the lowdown on the strengths of this impressive material. Recent advances in powder manufacturing and processing have made chromium an attractive element in P/M manufacturing. In addition to chromiumís positive affects on strength and hardenability, it is also a cost effective alternative to traditional alloying elements, such as nickel and molybdenum. 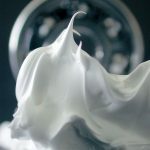 The purpose of this paper will be to demonstrate how a Cr-Mo alloy, Astaloy CrL, can be used to replace a more expensive traditional alloy system, FLN2-4405. Sintered and heat treated properties will be presented. Molybdenum is a common alloying element for pre-alloyed and diffusion alloyed base irons in the P/M industry. Molybdenum provides increased strength and hardenability while having a less detrimental effect on compressibility than do other common pre-alloying elements, such as nickel. There are a variety of iron powders available today with molybdenum pre-alloyed and diffusion alloyed. Some of the commonly used grades are pre-alloyed or diffusion alloyed with 0.50w/o, 0.85 w/o, or 1.50 w/o molybdenum. Pre-alloyed molybdenum grades are often admixed with graphite, copper, or nickel to further enhance the properties. Diffusion alloyed grades are usually admixed with graphite since they typically have copper and nickel already diffusion alloyed. MPIF FLN2-4405 is a common example of a grade that uses pre-alloyed molybdenum. 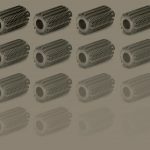 This designation admixes a 0.85w/o Mo pre-alloyed base iron with 2.00 w/o elemental nickel powder and 0.5 w/o carbon after sintering to provide good as-sintered and heat treated properties. 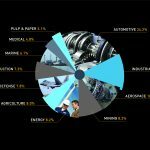 Recent events in the alloy market have made traditional alloying elements such as molybdenum and nickel less attractive. In the past one to two years, both of these elements have been subject to dramatic increases in price. From early 1999 to mid-2004, for example, nickel increased in price from slightly more than $2.00/lb to over $6.00/lb. An increase in the price of nickel of $4.00/lb translates to an increase in the premix price of $0.08/lb (for a 2.00 w/o nickel containing alloy system). Molybdenum has seen even more dramatic increases in cost over the same time period. 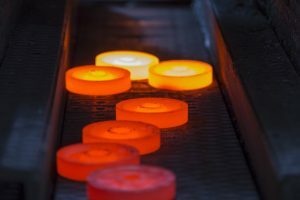 These increases, combined with higher scrap prices and an unwillingness in end users to accept price increases, have forced P/M manufacturers to seek alloying elements that offer good material properties at more attractive costs. Chromium is an example of an alloying element that has been attracting more attention. In the past, chromium has not been widely used in the P/M industry, despite the potential for low cost and positive impact on properties. Chromiumís affinity for forming stable oxides at relatively high temperatures has created a reputation for chromium that it is difficult to use. 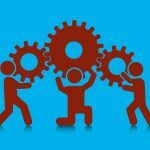 Recent advances in P/M manufacturing technologies have made this less of an issue. The nitrogen-hydrogen based atmospheres used in North American P/M manufacturing have sufficiently low oxygen content to prevent oxidation during the sintering process. 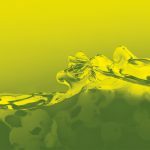 These nitrogen-hydrogen atmospheres, combined with advances in powder manufacturing and low relative cost, have made chromium an attractive alloying element for the P/M industry. One example of a chromium based material is Astaloy CrL from North American Höganäs. Astaloy CrL, introduced in 2001, is a fully pre-alloyed base iron containing 1.50 percent w/o Cr and 0.20 w/o Mo. This material system provides a wide range of properties by varying the sintered carbon content. Carbon contents of 0.40 w/o provide properties similar to the MPIF FC-0208 system, while 0.75 w/o carbon and 1.00 w/o copper can provide sinter-hardened properties similar to the MPIF FLC-4608 system. In addition, since the material is fully pre-alloyed, the potential exists for other improvements such as greater dimensional control. This versatility, combined with the low and stable price for Cr, provide the opportunity for material cost savings at P/M manufacturers. 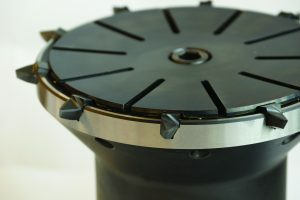 A partnership between North American Höganäs and Cloyes Gear Products evaluated the potential for using the Cr-Mo system in production. Cloyes selected the FLN2-4405 system as the baseline for comparison. 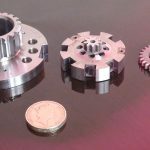 The FLN2-4405 system is commonly used by Cloyes in the processing of as-sintered and induction hardened sprockets and gears. The purpose of this paper will be to examine the soon to be standardized Cr-Mo system as a replacement for the FLN2-4405 system in a production environment by evaluating both test specimens and components. Test specimens and gears were manufactured in order to evaluate Astaloy CrL (Cr-Mo) as a replacement for FLN2-4405. Tensile bars, transverse rupture strength bars, and Charpy impact energy bars were manufactured according to MPIF Standard 60 by North American Höganäs using a Gasbarre 60 st hydraulic laboratory press. The sintered properties of the bars were evaluated according to MPIF standards 10, 40, and 45. The test specimens were also evaluated for green and sintered density (MPIF Standard 42), compressibility (MPIF Standard 45), apparent hardness (Standard 43), and dimensional change (Standard 44). The test specimens were compacted at 575, 650, and 700 MPa (40, 45, and 50 tsi). These compaction pressures were selected in order to simulate the normal conditions at Cloyes during production. The premixes found in (Table I) were evaluated. Tensile and Charpy impact energy testing was done by Westmoreland Mechanical Research. All other evaluation of the test specimens was completed at the North American Höganäs Technology Center. 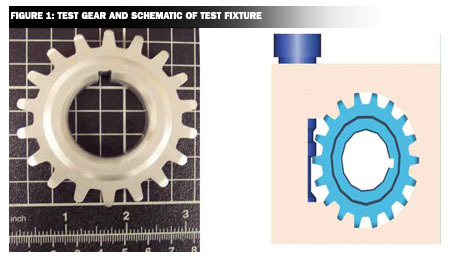 In addition to the test specimens, gears (Figure 1) were manufactured by Cloyes to evaluate the single tooth bending strength of each material. 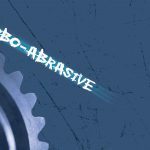 The single tooth bending strength of the gears was evaluated in both the as-sintered and induction hardened conditions. 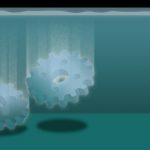 The selected gear is used internally by Cloyes to classify materials according to single tooth bending strength. The single tooth bending strength was evaluated using a compression testing machine and a fixture (Figure 1) at Cloyes according to their internal procedure. 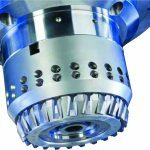 A maximum of three teeth per gear were evaluated for each manufacturing condition and density to avoid re-testing a tooth. The test specimens and gears were sintered using standard Cloyes sintering conditions on an Abbott 36” mesh belt furnace (Table II). These conditions represent the standard operating conditions for production at Cloyes. For the purposes of this study, the properties were evaluated only at normal cooling rates. 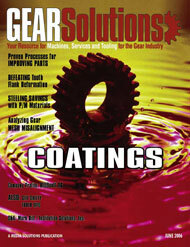 Induction hardening of sprockets and gears is another common practice at Cloyes. Gears were induction hardened on a Radyne unit using standard settings (12 second heating, 140°F oil) for the Mo-Ni material. The single tooth rupture strength was then compared for each material and processing condition. No evaluation of induction hardened test specimens was possible, and the system was not modified or optimized to accommodate the Cr-Mo material. The green densities for each material are shown in ( Table II). It can be seen from this data that the Mo pre-alloyed base iron has better compressibility than the Cr-Mo pre-alloyed iron. In general, the Mo-Ni material achieves an average of 0.10 g/cm3 increase in green density compared to the Cr-Mo system. The sintered densities are shown in (Table IV). The Mo-Ni materials show a higher average level of shrinkage (0.05 g/cm3) compared to the Cr-Mo materials (0.03 g/cm3). Both materials display relatively consistent dimensional change, regardless of density. This characteristic is important when manufacturing components with irregular shapes and varying densities in different areas. A potential advantage of the Cr-Mo systemónot evaluated here, but demonstrated in previous studiesóis dimensional stability. The Mo-Ni system uses admixed Ni powder that can segregate during handling of the premix. The Cr-Mo system is entirely pre-alloyed, reducing the potential for segregation during handling. Previous studies have demonstrated that consistency in material composition improves the dimensional stability. The green and sintered densities achieved using the Mo-Ni system are higher on average than those achieved with the Cr-Mo system. However, the sintered properties show that equivalent densities may not be required in all cases. 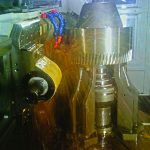 As can be seen in ( Table V), the mechanical properties for the Cr-Mo materials are approximately 10 percent higher than the Mo-Ni material at approximately 7.05 g/cm3 sintered density. The increased strength at a given density means that the density can be lowered for the Cr-Mo and still achieve equivalent properties. The sintered carbon for each material was approximately 0.55 percent. Although the tensile properties are the same at lower density, it can be noted that the apparent hardness is slightly lower due to the lower density. The metallographic examination in ( Figure 2) shows a mostly bainitic microstructure for each material. However, the Mo-Ni material has islands of austenite from the admixed nickel, whereas the Cr-Mo material is very homogeneous. The final stage of the evaluation was to compare the single tooth bending strength of the two materials at each compaction pressure. 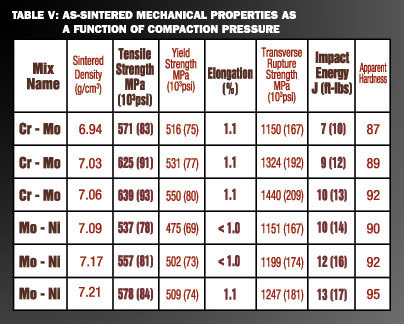 ( Table VI) shows the data for the as-sintered single tooth bending strength. 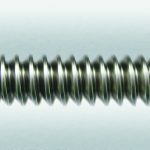 In the as-sintered condition it can be clearly seen that, for a given compaction pressure, the single tooth bending strength is equivalent for both material systems. 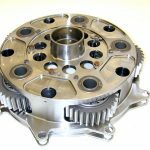 (Table VII) contains the data for the single tooth bending strength of the induction hardened gears. As can be seen in this data, the single tooth bending strength for the Mo-Ni system is higher. This can be attributed to the higher hardenability effect of the Mo-Ni material compared to the Cr-Mo material. By evaluating the hardenability multiplication factor for each material, it can be speculated that an elemental Ni addition of < 1.0 percent would improve the hardenability of the Cr-Mo material sufficiently to achieve comparable induction hardened tooth strengths. Based on the evaluation, the following conclusions can be made. The Cr-Mo material system using Astaloy CrL can provide equivalent or improved as-sintered properties compared to the FLN2-4405 system at equivalent compaction pressures. The material properties of the Cr-Mo system exceed the FLN2-4405 properties at a given density by approximately 10 percent. Cr-Mo materials can be efficiently processed using existing production sintering conditions. The induction hardening response of the studied Cr-Mo system is not quite equivalent to the Mo-Ni system, although it could be improved by the addition of <1 percent Ni. 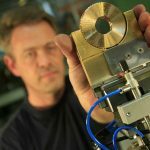 The Cr-Mo system provides a cost effective alternative for P/M component manufacturers. 1) Höganäs Handbook for Sintered Components: Metallography; Vol. 6; 1999. 2) MPIF Standard 35: Material Standards for P/M Structural Parts 2003 Edition, Metal Powder Industries Federation, Princeton, NJ, 2003. 3) American Metal Market. “Steel Surcharges, Scrap Export Controls, and China.” June 7, 2004. 4) Lindqvist, Bj–rn, Höganäs AB, Kanno, Koki, Höganäs Japan ìConsiderations When Sintering Oxidation Sensitive Materials,” Advances in Powder Metallurgy and Particulate Materials 2002, compiled by Volker Arnold, Chiu-Lung Chiu, William Jandeska, Jr. and Howard I. Sanderow, Metal Powders Industries Federation, Princeton, NJ, 2002. 5) Berg, Sigurd, Maroli, Barbara, Höganäs AB ìProperties Obtained by Cr Containing Materials,” Advances in Powder Metallurgy and Particulate Materials 2002, compiled by Volker Arnold, Chiu-Lung Chiu, William Jandeska, Jr. and Howard I. Sanderow, Metal Powders Industries Federation, Princeton, NJ, 2002. Special thanks to Jerry Wewers and Junior Schluterman of Cloyes Gear and Mary Schmidt, Roland Warzel, and Alex Klekovkin of North American Höganäs. This paper would not be possible without their kind assistance. is with Cloyes Gear Products. To learn more go to [www.cloyes.com]. is with North American Hogan's. For more information visit online at [www.hoganas.com].